“Growth mindset” seems to be a buzz word in teacher training and education reform these days. There’s a lot of good research out there and many educational theorists who are discussing growth mindset. You’ve probably seen the work of Carol Dweck and Jo Boaler, and the purpose of this article is not outline their research and priorities for your classroom, but rather to discuss what it means for us, for you and for me, to change our own mindsets. Helping students shift from fixed mindsets to growth mindsets starts with their teacher's mindset. 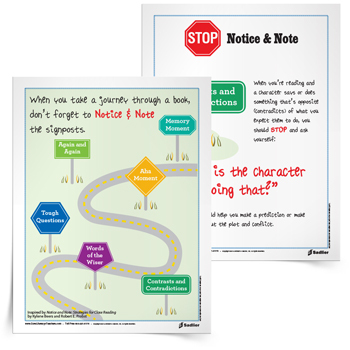 Download the Communicating with a Growth Mindset Tip Sheet now. 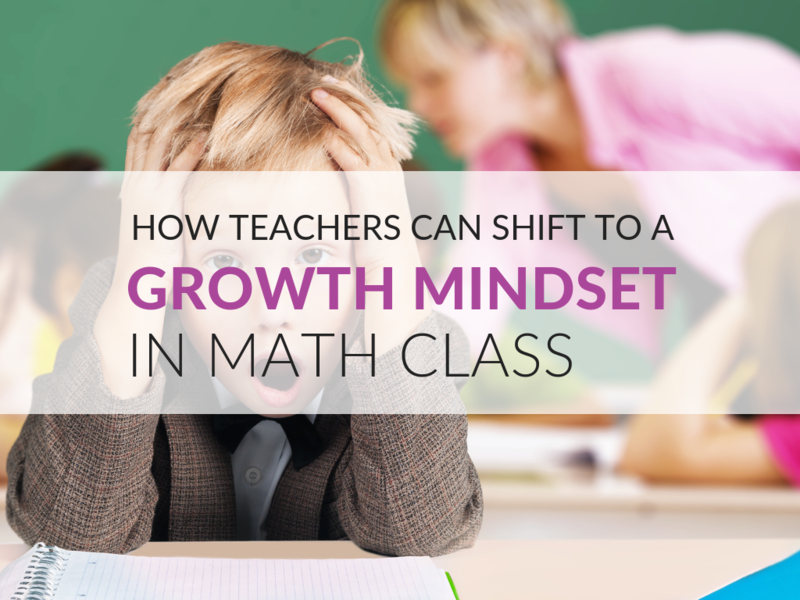 Recently, I have been talking with my good friend and colleague Matthew Beyranevand about growth mindset in math. The Director of Math and Science Curriculum in a neighboring public district, as well as a National Presenter and Author on student learning, Dr. Beyranevand and I have been colleagues and friends for a number of years. We shared time together in graduate school, and as a Middle School Math Specialist, I spent time watching him teach. In my role as a specialist, I was well aware that his local and state testing data supported what I saw in his classroom—that he is a great teacher, and that his students had positive growth mindsets and a love for mathematics. What struck me in my conversation with Matthew a few weeks ago is that he referred several times to the need for teachers to change their own mindset about growth. He maintains this belief, and works through his seminars, to help teachers make this shift. If teachers do not shift their own mindsets, they will never convince students that they should shift theirs! Since Matthew and I share a lot of common ground regarding what we learned in our graduate program, many of his thoughts on developing a growth mindset seemed quite familiar. We both agree about what solid math teaching is, and that a growth mindset for teachers is based on these two underlying assumptions: 1) That all students can and want to learn must be a core belief of the teacher; and 2) That solid mathematics lesson planning and pedagogy can help structure classroom experiences that engage students and promote a growth mindset. 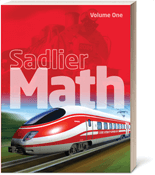 Implicit in the title of the 2002 No Child Left Behind Act, is the idea that all students should be able to learn math. The recent data from international testing show that we are making progress in the United States, but despite this growth there remain persistent gaps in achievement related to race, ethnicity and income. Students from these groups are under-represented in the Science Technology, Math and Engineering programs at the post-secondary level. Many students graduate from high school and are not prepared for the rigors of college. In fact, despite 25 years of “leaving no child behind,” we are still doing so. Thus the need for a renewed emphasis on a growth mindset, so that every child can learn. Here are some ideas that Matthew Beyranevand shared about teachers making the shift to a growth mindset. Teachers need to create an environment in their classes that leads students to notice that mathematics is interesting and to create a sense of wonder among their students. This leads to authentic engagement and requires that teachers see math as something exciting and interesting, rather than as routine and algorithmic. Teachers need to adopt a mindset where mistakes are both common and accepted in the classroom. 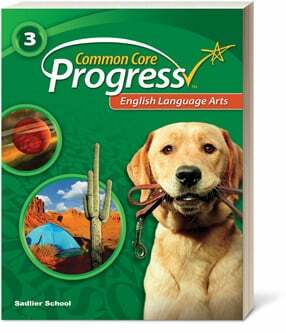 For example, after students have initially learned about a topic, the teacher can introduce incorrect examples and show problems with common errors. This promotes the idea that mistakes should be a topic of conversation among the class and between peers. Teachers need to learn to validate students who make mistakes. Looking at a problem for what has been done well, despite the fact that there are mistakes, helps build students’ self efficacy. They have learned something about the topic without yet mastering it. The word “yet” is an important part of the discussion between a student and the teacher who has adopted a growth mindset. Teachers need to choose their words carefully. For the most part, we weren’t part of a growth mindset culture in the schools we attended. We are used to the old “scripts” of the classroom. I have had to carefully reconsider what I say to students about their work. As part of Sadlier's new PD in Your Pocket series, I created a printable PDF download that shows teachers growth mindset versus fixed mindset interactions with students. This one-page download would be perfect to take to a professional learning community or department meeting in order to spur discussion about how to rethink how you interact with students. You might also want to post it in view of where you teach in your classroom to remind you of the mindset you want to demonstrate in your classroom. It lists ways that I used to speak with my students before I had consciously adopted a growth mindset and ways that I speak to them now in this new paradigm. 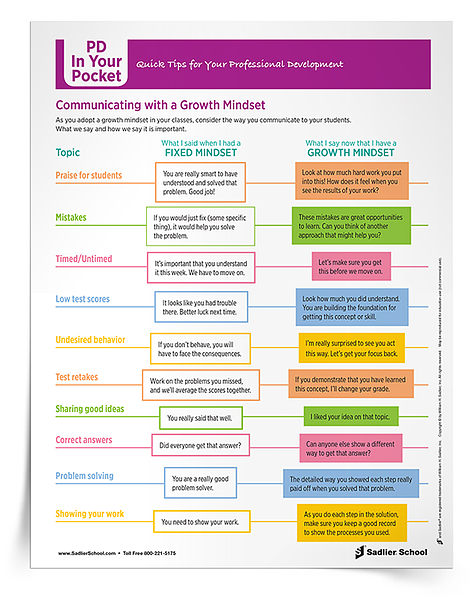 Download the Communicating with a Growth Mindset Tip Sheet now. If we want students to come to math class seeing it as an exciting and vibrant opportunity to learn about the world, we need to plan and to present it that way. 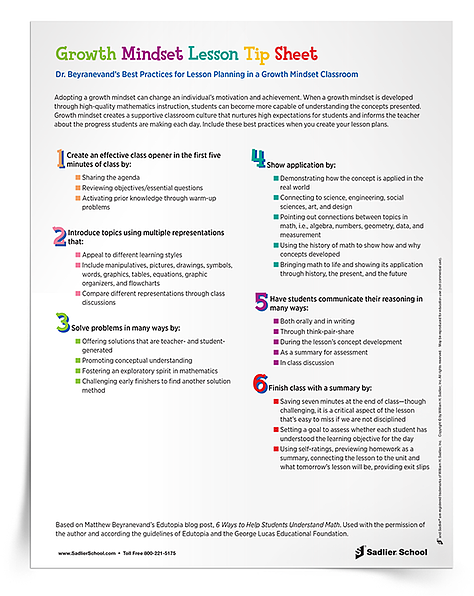 Beyranevand discusses these aspects of lesson planning that are critical reaching students in a blog post titled, 6 Ways to Help Students Understand Math. He has graciously allowed me to summarize the blog post in a Growth Mindset Lesson Tip Sheet. 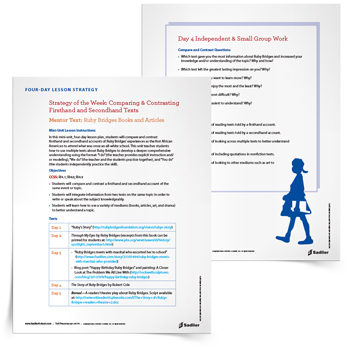 You can help students better understand math by presenting multiple examples, encouraging collaboration on alternative solutions, and framing the class with a clear agenda and effective summary. 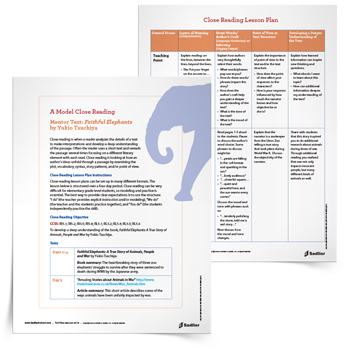 Having been trained as math educators in the same graduate program, I have seen firsthand how implementing Beyranevand’s lesson planning best practices have helped my students to achieve growth. Not only do they achieve that growth, they also develop understanding, admiration and even excitement about math. 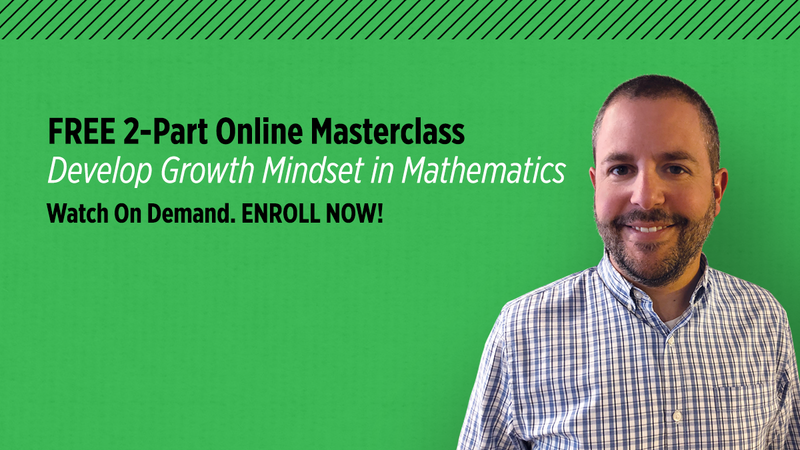 Finally, I am excited to announce that my friend and colleague, Matthew Beyranevand, has a free ON DEMAND Develop Growth Mindset in Mathematics Masterclass. If you would like to see how you can further your own journey from being a fixed-mindset teacher to a growth-mindset teacher, enroll now! I hope that this post’s two downloads will help you in becoming a stronger growth-mindset teacher, no matter where you are at the moment. 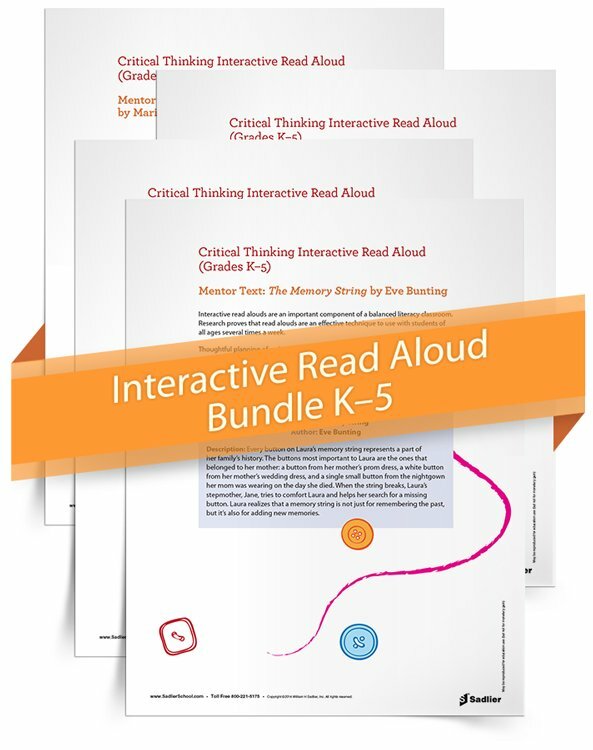 The first download shows the shifts in the ways I interact with students to promote growth mindset and the second download details Matthew Beyranevand’s best practices for lesson planning in a growth mindset classroom.